(Newser) – One more for the gold, and seemingly nothing can prevent it. This US men's basketball team might not slow down until it's standing at the center of the medals platform again. Kevin Durant scored 19 points, LeBron James and Carmelo Anthony added 18 apiece, and the US powered its way back to the gold-medal game by beating Argentina 109-83 today. 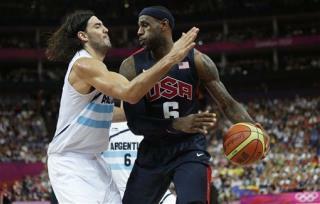 The Americans play Spain on Sunday in the title game. The US scored a record-breaking victory in the women's 4x100-meter relay. The crowd cheered wildly as Carmelita Jeter crossed the line as the clock marked 40.82 seconds—well below East Germany's 41.37 record from 1985. Teammates Tianna Madison, Allyson Felix, and Bianca Knight gave the US a big lead heading into the anchor leg. Olympic silver medalist Bryshon Nellum was picked to carry the US flag at Sunday's closing ceremony. With a surge of medals in track and field, the United States has sprinted ahead of China and is poised to finish atop the medals table—maybe with the most golds ever collected by the Americans on foreign soil. The US led China 94 to 81 in total medals and 41 to 37 in golds. It needs four more golds to tie the mark. Spain will win the competition. USA will win the exhibition.